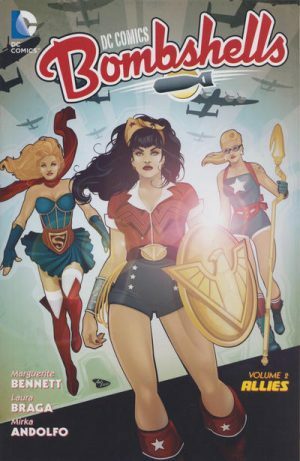 This may be a new series of Bombshells, but the setting remains an alternative Earth during World War II, moving forward to 1943 with variant versions of DC’s female characters (and some men). In fact Marguerite Bennett picks up right where she left off with War Stories, except now the focus is on what’s happening in the USA. In addition to continuing with a positive, female centred story, Bennett lays out her stall by beginning with a shameful real world stain on the USA, the internment of all Japanese Americans during World War II. In this world, at least, it’s not an atrocity that goes by without comment in the course of stories written as refugees and immigration were again issues in America. A surprise villain is used to make somewhat strained comparisons about what it is to be American, but their presence works well in another sense because they ensure there can never be certainty about anyone’s identity. 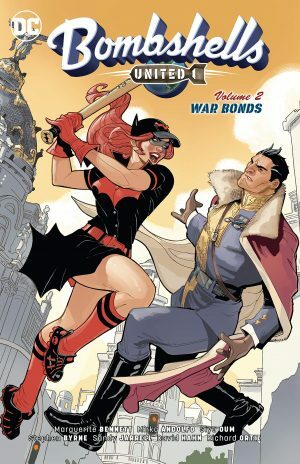 Several artists make their Bombshells début in this collection, and there’s a greater variety of styles than in previous books, although due to the episodic nature of the stories, this is no drawback. Marcelo DiChiara (sample spread left) stands out by virtue of having a far sketchier form of cartooning than seen on the series, but that looseness brings a good sense of motion. Lucciano Veccio takes his influences from manga, and his posed art isn’t as attractive, but David Hahn’s chapter of contrast and possibilities is nicely handled. 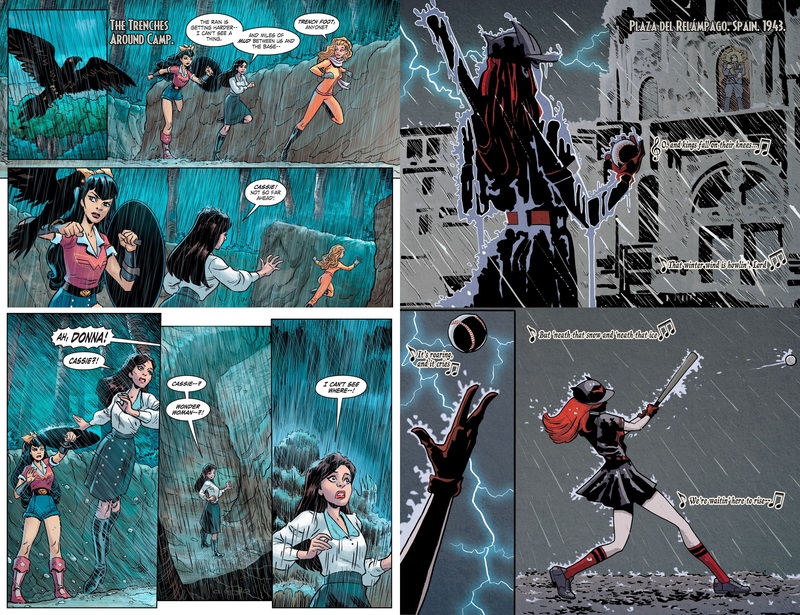 Siya Oum seems to have had more time on her first contribution than her second, which is more ordinary, and Sandy Jarrell (sample spread right) has high standards to match, and produces two great chapters at the end. Several artists include complex pin-up montages, with Marguerite Sauvage’s near the start a real stunner. For all the good intentions of addressing a wrong and prioritising positivity, some of Bennett’s writing is laboured, reiterating points at too great a length when they could have been effectively made more concisely. 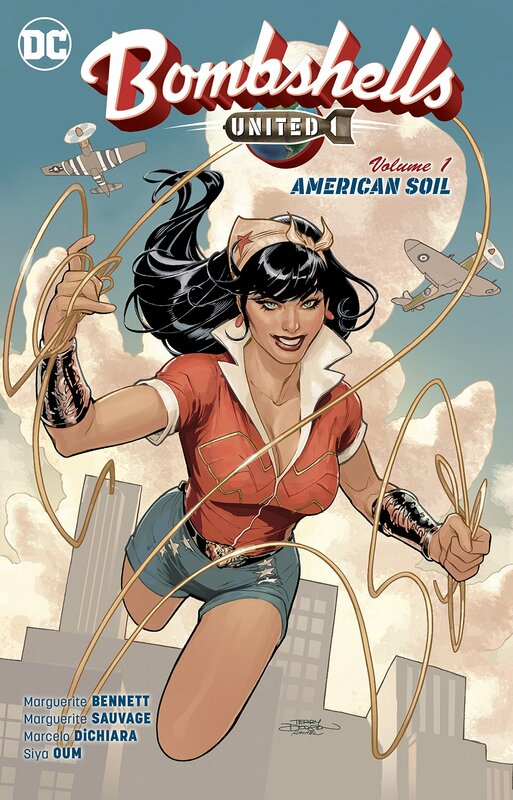 Wonder Woman is very much the focus of American Soil, along with associated characters Donna Troy and Cassie Sandmark, both of whom have had spells as Wonder Girl in the ‘real’ DC universe. Wonder Woman being an inspiration is worthwhile, but the resulting Wonder Girls are too similar to the Batgirls of Gotham introduced during the previous series, with their ally the one exception. Revealing them enters spoiler territory, but Bennett not only cleverly subverts the ratios of men and women in superhero comics, she also defies expectations for dealing with a misguided villain. 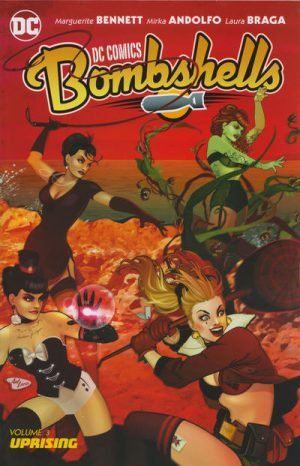 The concluding episodes are better, with Bennett now very good at taking a look at the wide cast in small snippets, this time with music and lyrics accompaniment that ties into a new character introduced to the Bombshells, someone so far missing that might have been presumed an obvious choice for inclusion. 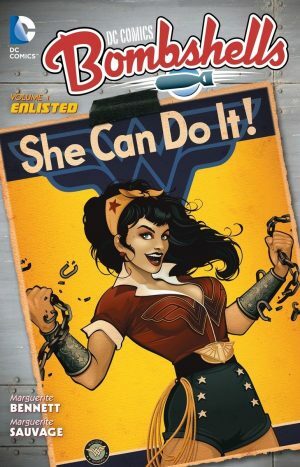 She’s not the only new face as Bennett looks in on the equivalents of other DC heroines so far not not used. Dawnstar’s introduction and new rationale in the earlier story was a highspot, and these two chapters are the best in the book, thrilling and teasing with possibilities to come. Next volume is War Bonds.